Do you like the concept of giving a gift that will truly become an heirloom keepsake? Do you enjoy giving presents that are multifunctional? If so, you will want to consider adding baptism handkerchiefs to your list of awesome present ideas. 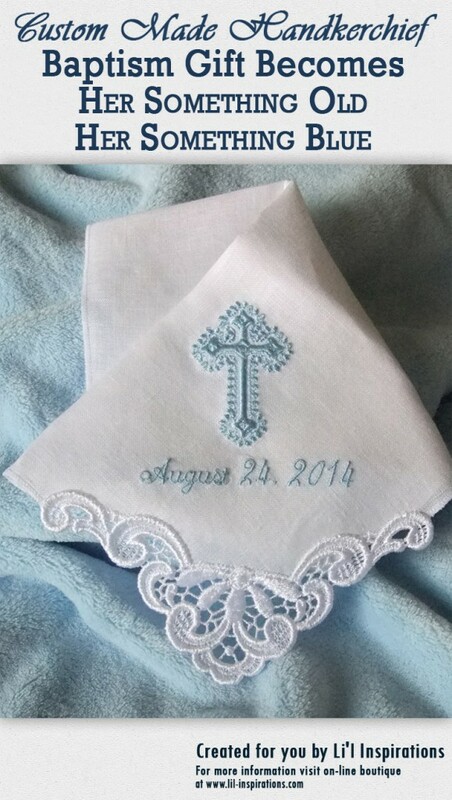 Giving a cotton embroidered handkerchief as a baptism gift serves two purposes. Your present initially serves as a reminder of your thoughtfulness on the christening or baptism of the little boy or girl. Once the child is all grown up and on the path towards married life, your handkerchief because a memento of the bride’s ‘something old’ gift and if you have the hanky embroidered with blue thread, it is also her ‘something blue’. If your original handkerchief was embroidered for a little boy, on the day he becomes a groom, he can bestow his hankie to his bride. It can become her: something old, something blue or if he can offer it to her for the day; to be her something borrowed. With a multitude of customization options available, you can give a gift that is both traditional and yet completely personalized. Add an elegant monogram of their initials, choose custom thread colors, and a scriptural symbol like a cross, and even add the baptism date too. How you customize your timeless gift is completely up to you. Whether your baptism handkerchief is given to a girl or a boy, it will surely become an heirloom keepsake. Creating lifelong memories with a commemorative embroidered handkerchief is easy. Click now to view my entire collection of couture made wedding and baptism handkerchiefs.